Little Rosebud found a wonderful family but her time with them was sadly short. She developed issues with her spinal cord and could not be saved despite every effort. Her memory will be forever cherished. We extend our sympathy to Curtis & Lisa and our deep appreciation for all the joy they gave to this precious little beagle. Rosebud arrived to our waiting arms just 12 days before Christmas. At 10 to 12 years old, it sadly wasn't Rosebud's first time winding up at the Ottawa Humane Society. She'd been lost by her owners on several occasions over the course of her life with them. But this last time she wound up at the shelter, they never came back to claim her. Perhaps, it was just as well. Poor Rosebud had a mouthful of rotting, painful teeth that needed removing. So she underwent a major dental surgery only days before the HOWLidays were upon us. Bloodwork came back beautifully! Aside from those bad teeth that needed yanking, she's in excellent health! After ridding herself of those painful chicklets, she's recovering nicely in her foster home but we all think how much happier she will be when we find her FURever home. She's currently doing her best to fit in at Sheba's Haven. So close to the holidays, the only space we could find her was at the Haven where she must share the love and attention of the Haven's wonderful caregivers with over a dozen other dogs living there permanently due to chronic and terminal illness. Little Rosebud is fortunate to be in perfect health and so deserves a family all her own. Could YOU be that family? Don't hesitate to let us know by filling out an Adoption Application today! *Rosebud's rescue is a clear reminder of how important our Foster Families are to us. We have high hopes to find more dedicated foster families for 2015. Raising the funds to save beagles in need is only one of our challenges. After all, money can't buy them love! 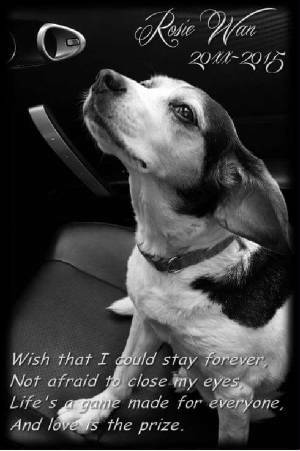 We also need the Foster Homes or we simply cannot save every beagle that needs a specialized organization like ours to come to their rescue! If Fostering is something you'd like to consider, please don't hesitate to fill out a Foster Application today! 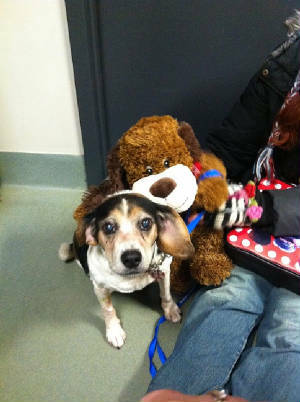 Beagles like Rosebud need YOU!